If your dog suddenly develops a swollen nose, it could be due to one of several causes. Whenever you note swelling of the nose, see your veterinarian. This condition needs an examination and professional diagnosis. Trauma from getting struck by an object, punctured by a sharp object, being bitten, getting stung by an insect, etc. Allergic reaction to insect bites and stings, medications, and other allergens. The swelling might involve the whole nose or just one side. Also note whether other other areas of the face are swollen, which could point to causes including lymphatic obstruction, parasitic infestation, or congestive heart failure. The veterinarian will need a good history from you as to any possible trauma, bites, stings, medications, diet, and general health of your dog. The vet will do a physical examination and may take radiographs (X-rays). This dog was brought to the veterinarian for a very swollen nose, appearing just that morning. She was fine the night before, according to her owners. Nothing else out of order. Due to the sudden nature of the swollen appearance, an allergic reaction was the first suspect. The swelling did not go down with allergic reaction medications (Dexamethasone and diphenhydramine). The next step was to take radiographs of the nose and skull to see if perhaps a tumor or foreign body was in the nasal area causing the swelling. Sometimes tumors "quietly" grow, then erupt with infection. The radiographs showed something there. A tumor? Fluid? The area in question is just in front of the incisor teeth—the medium white area (opacity) just in front of the upper jaw. The tissue to the front and sides of the jaw is markedly swollen, with more uniform opacity on the right side. The next step was to perform a fine needle aspirate to take a look at the cells making up this swollen mass. When the needle was inserted to collect the specimen, it released smelly pus, the sign of an infection. The large mass was an abscess. A grass awn, common in the area that this dog lives, was the first suspected cause of the abscess. However, upon further questioning, it was determined that this dog had a run-in with a porcupine two weeks earlier. The quills were removed at home, but one must have broken off, worked its way in, and was missed, causing it to form an abscess. The area was flushed out well, but no quill remnants were found. This one will need monitoring for future problems. Hopefully, the foreign body was small and flushed out in the process. Porcupine quills are hollow and black tips break off easily. 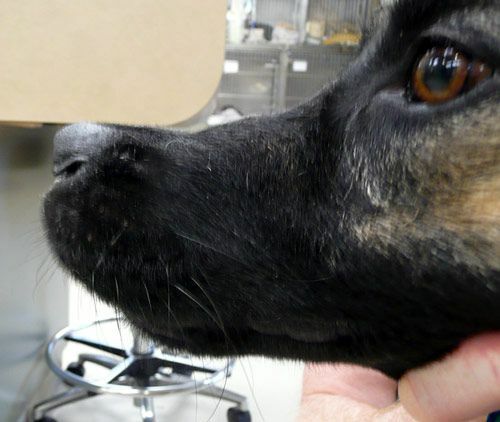 In this dog, finding small black quills on a black nose and muzzle are difficult at best, especially two weeks after the incident. After a thorough flushing of the abscess and some antibiotics, this dog was happy and good to go. Hopefully, she will steer clear of those porcupines.